Instead of using expensive diamond drum wheels and dry diamond polishing drums, our 1.5" green grinding stones do an excellent job to smooth out the inside radius of the undermount sink. 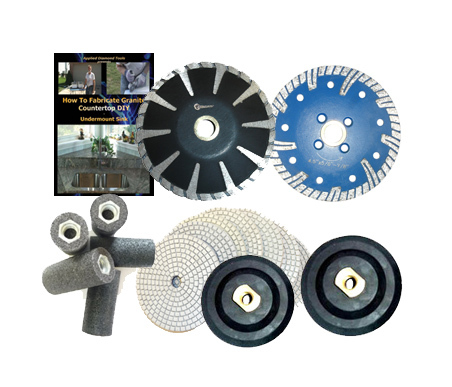 You will then use 4" dry diamond polishing pads with a 3" semi rigid back holder to polish inside radius of undermount sink. These tools are very effective yet economical. 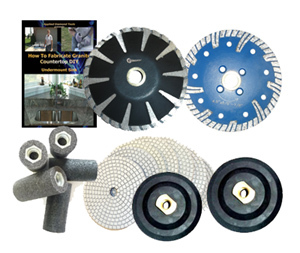 The diamond blades and diamond polishing pads do not last only one or two undermount sinks, but multiple jobs. a set of 1.5" green grinding stones (5 pieces with different grits) for smooth out the radius edges.